Senator Bernie Sanders (I- VT), the longest-serving independent in congressional history, is going to announce his run for the U.S. presidency on Thursday, proving that when someone says they're 99% sure they're not going to do something, that 1% can still happen. 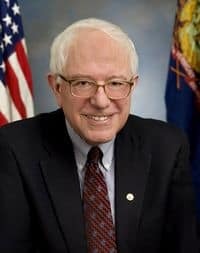 The self-described democratic socialist will be directly competing with Hillary Clinton by running as a Democrat on the ballot, though registration rules in Vermont will not require him to officially change parties. I like Hillary. I knew her when I was in the House and she was First Lady, and obviously I knew her when she and I served together in the Senate. So I like her. She’s a very, very intelligent person, no question about it. But I think, you know, if you talk about the need for a political revolution in America, I think it’s fair to say that Secretary Clinton probably will not be one of the more active people. Is Hillary Clinton, are other candidates, prepared to take on the billionaire class? Based on her record, I don't think so. So far the political landscape appeared to be shaping up as Clinton versus a veritable clown car of right-wing wackjobs, thus effectively guaranteeing Clinton a victory. With Sanders entering the race, the waters are bound to get much muddier: Clinton has experience in the White House already, and following up the first black president with the first female president would be quite the flourish in the country's march towards greater equality, but continuing a dynasty of (primarily) two families warring over the presidency is something that gives many pause; meanwhile, Sanders is one of the most truly and fiercely progressive voices in American politics and has political experience a mile long, but his relative lack of presence with the general public and his advanced age are two things that could be leveraged against him. Pop some popcorn; things are about to get interesting.